Regiment/Catrawd: Labour Corps, 442nd Agricultural Coy. Medals Awarded / Medalau a ddyfarnwyd: As Eddie did not serve abroad he would not have been entitled to any medals. The 1891 census records the family living at 23, Sankey Street, Widnes, Lancashire. Head of the household was John Roberts, 32 a Copper Worker, who had been born in Bagillt, Flintshire. His wife Eliza, 33 had been born in Hawarden. Their listed children were John, 13, William, 10 and Edward, 3. The enumerator stated that they had all been born in Flints. UK, Soldiers Died in the Great War, 1914-1919 accessible on www.ancestry.co.uk confirms Eddie’s regimental information as above and tells us that his birth place was Widnes, Lancashire and his residence was Buckley. He had enlisted in Shotton and his Theatre of War was “Home”. There is an index card for Eddie in The Flintshire Roll of Honour at The County Record Office in Hawarden (Card F9 Sandycroft). It gives the address Queens Ave., Sandycroft and confirms his regimental details as Private 498048. Labour Battalion, Newport. The card states that he served for a period of 10 Months and died of pneumonia on the 8th October 1918. The card was signed on the 28th September 1919 by Bertha Roberts. FLINTSHIRE OBSERVER & NEWS – 31st October 1918 – excerpt of article below, re the Flu epidemic that raged through Flintshire, which was one of the worst counties. There are in Connah’s Quay and Shotton numerous sufferers, but except in the case of a few families the attack has been comparatively light. Only one or two deaths have taken place, and a local doctor gave it as his opinion at the week-end that the turning of the tide in the locality had come. Nevertheless a large number of residents have been and many still are laid up, and school, week-day and Sunday, as well as Sunday services and other assemblages, have witnessed to the prevalence of influenza by their depleted numbers. St. Mark’s Schools have been closed during the present week, the chemists have been besieged for the last fortnight for remedies, one of them Mr. T.C.JONES, having to retire to bed a victim of the epidemic, and the doctors and local nurses, including the district nurse, have had the busiest and most anxious time they have had for some years. 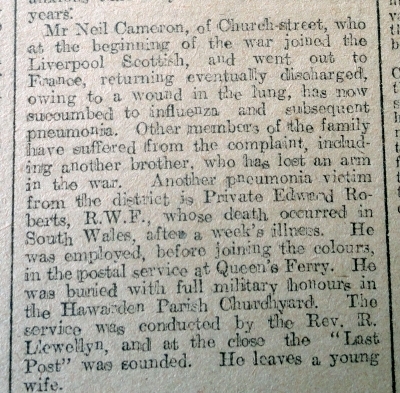 Mr Neil CAMERON, of Church-street, who at the beginning of the war joined the Liverpool Scottish, and went out to France, returning eventually discharged owing to a wound in the lung, has now succumbed to influenza and subsequent pneumonia. Other members of the family have suffered from the complaint, including another brother, who has lost an arm in the war. 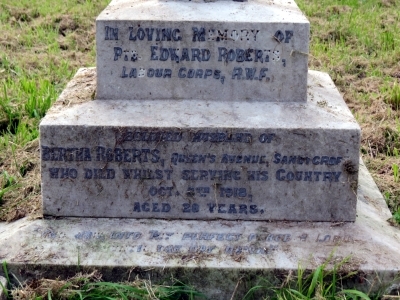 Another pneumonia victim from the district is Private Edward ROBERTS, R.W.F., whose death occurred in South Wales, after a week’s illness. He was employed, before joining the colours, in the postal service at Queen’s Ferry. 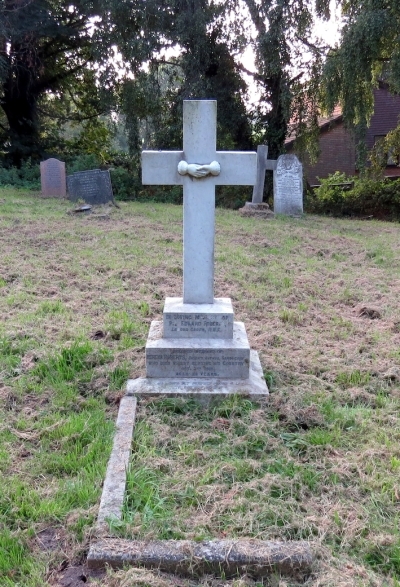 He was buried with full military honours in the Hawarden Parish Churchyard. The service was conducted by the Rev. R. LLEWELLYN, and at the close the “Last Post” was sounded. He leaves a young wife. who died whilst serving his country Oct 8th 1918 aged 28 years. In loving memory of Thomas beloved Husband of Bertha Hughes of Ewloe died July 18 1958 aged 75 years. Photo by Ian MacFarlaine, (Find a Grave), many thanks to him. Bertha had remarried after Edward’s death, again in St Deniol’s Church, Hawarden, on the 5th April, 1920 to Thomas Hughes, 37, a widower and Iron Worker, who lived in Shotton.